By Erica Batten. The construction industry is projected to grow 4.5 percent over the next few years, reaching $1.2 trillion in real output by 2020. Much of the growth is directly related to government activity. Reconstruction of roads, bridges and other infrastructure, along with the government’s plan to make renewable energy 20 percent of the country’s energy use over the next two years, will create demand for both labor and materials. Industry analysts have identified a series of business cycles that help predict where the construction industry is headed. Dodge Data and Analytics Chief Economist Robert Murray and his team have used data from these cycles since 1975 to develop a market forecasting service for construction. The current cycle started from a trough in 2011 and has followed a fairly steady growth pattern since then. And this cycle has unique promising aspects. “The key feature this time is that we’re not looking at the imbalances we had with previous upturns,” Murray said. In the cycle that peaked in the mid-1980s, for example, office buildings were overbuilt. That had a negative impact on the construction industry in the following decade. At this point in the cycle, schools, hospitals and other institutional projects tend to be the main focus of industry activity, Murray said. But the tax reform bill may provide what he called a “second-stage lift” for commercial projects. Residential construction is also expected to grow as the U. S. population increases by a projected 20 million by 2020. 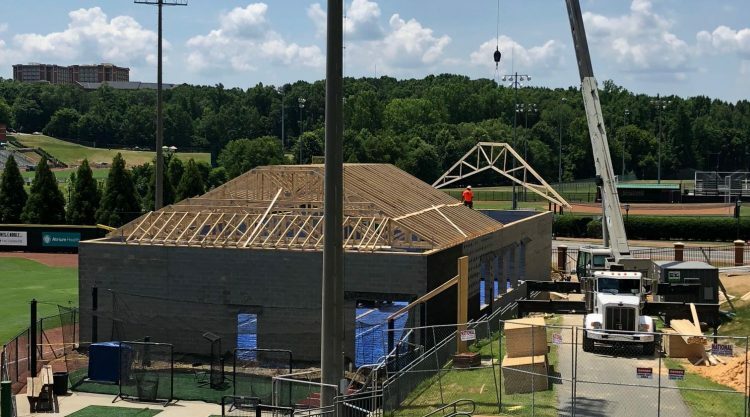 “The metro Charlotte market is as hot as it’s ever been,” said Philip Geiger, director of business development at Newton Construction Services in Cornelius, a commercial builder. The firm is currently working on projects at CPCC Central High School and UNC-Charlotte, among others. “However, there is a serious labor shortage and material pricing issue,” Geiger said. Some analysts have expressed concern about a lack of skilled construction labor acting as an anchor on business. During the recession a decade ago, the construction industry lost 1.5 million workers. Too, with an average age of 45-50 years, construction workers are aging out as firms struggle to attract younger skilled labor. “My entire generation has been conditioned to see college as the only gateway to gainful employment,” said Geiger, who is 48. Because of this belief, the industry has “lost an entire generation,” he said. Geiger said the labor shortage affects not only the general contractor, but also subcontractors and material suppliers, who also rely on skilled labor. Labor shortages lead to delays and price increases as employers compete for qualified workers. While Murray did cite rising interest rates, higher material costs, and labor shortages as “headwinds” to increased growth, he insisted that more fundamental factors, like vacancy rates—which continue to be low—are better indicators of future growth than labor and material costs. And the Supreme Court’s decision earlier this year on DACA could mean another 100,000 current workers remain in the country. North Carolina’s construction industry is on track to expand 6 percent this year, according to the 2018 North American Construction Forecast Report from Oldcastle Business Intelligence. The Charlotte metro area is slightly below this expected trend, but still in the healthy range of 3-7.9 percent. One area of especially high growth is Cabarrus County. Concord is among the fastest-growing of Charlotte’s satellites, with amenities such as Concord Mills, the regional airport and many business parks—not to mention Charlotte Motor Speedway and several race teams and the NASCAR Research and Development Facility—attracting more and more visitors and permanent residents each year. The City of Concord’s Planning Department expects Cabarrus County’s population to double over the next 25 years, from roughly 200,000 to 400,000 people. Based on this projected growth, Concord expects to need 30,000 new housing units by 2035. Concord’s 2030 Land Use Plan includes the current city limits and a surrounding “study area” for future possible annexation that would nearly double the city’s footprint. The Lake Norman area also continues to grow. Most projects in the planning or construction phases for Cornelius and Davidson are residential or mixed-use properties, such as Cambridge Square in Cornelius, an 8.4 acre development on West Catawba Avenue with 21 single-family homes and two commercial buildings proposed. The Davidson East development by CalAtlantic Homes includes almost 500 housing units and more than 400,000 square feet of office and retail space on Davidson-Concord Road.